We woke up nice and early on day six. It was nice to do so and not be freezing. Our hotel, the Twin Falls Super 8, provided a free continental breakfast to get us started. I took all our stuff out to the car and the moon was still out. It was really big and low in the pre-dawn sky. Once everyone was loaded we headed for a Costco nearby to get gas. Fuel was getting expensive as we drove West so we used the Gas Buddy app to find the cheapest stations each place we went. If there was a Costco in the area it was usually the cheapest. With a full tank we drove fifteen minutes East to Shoshone Falls, “the Niagara of the West”. With a nickname like that I was thrilled to see it was along our route. When I’m planning trips I seek anything cool I can possibly see. Large waterfalls definitely fit the bill. The surrounding area was normal farmland but right as we entered the park the scenery changed dramatically. The falls are on the Snake River which has carved a decent canyon out of nowhere. The drive down towards the falls was steep and winding. There are smaller waterfalls on the canyon walls along the road. Entry to the park was supposed to be $3 but we didn’t see any place to pay. It wasn’t long before we figured out why. We parked (car two of two that early in the morning) and from the overlook it was clear that something was off. The water. The water was off. Well, 85% of it anyway. There was a big sign explaining that the hydroelectric dam behind the falls was being worked on. Apparently, during this three year renovation project, water over the falls is being diverted occasionally to work on the power plant. Labor Day (three days before) was the shut off for the summer. Wah wah. Oh well. Based on the size of the falls I could see how they would be very impressive when in full force. After all, Shoshone Falls are 45 feet taller than Niagara Falls at 212 feet (it’s also 1000 feet wide). Sunrise over the canyon was still worth the stop. I was happy that Beth got to witness at least one canyon sunrise on the trip. Being more of a morning person, I was driving so Beth entered the next address into her phone’s GPS. We had a very long journey ahead of us so she went back to sleep. There isn’t an interstate South of Twin Falls so I was forced to endure 122 miles of two lane highways. At least the speed limit was 75 most of the way! Every time I got stuck behind a slowpoke, though, I had to speed around them using the on-coming lane. I hate doing that, it makes me nervous. I’m a very capable driver but that move still puts me on edge. We hit the Nevada border and I stopped to use the bathroom at a casino. They are typically cleaner than the average restaurant bathrooms, by the way. Eventually, we reached Interstate 80 and I was relieved to finally have more traffic lanes available. I was hungry for second breakfast so I found a Burger King. Beth bought some chicken fries and the dog went absolutely nuts over those things. She had the empty box stuck on her nose for a minute. 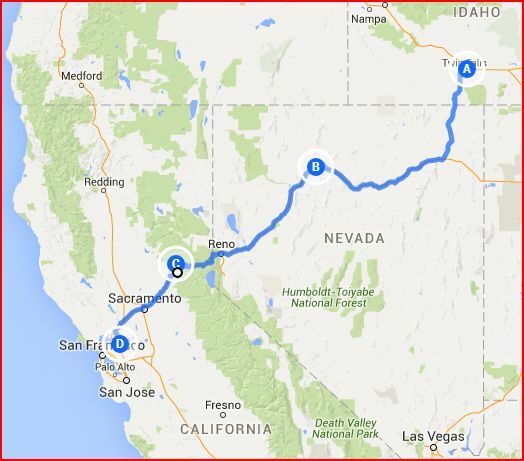 Beth drove between Elko and Winnemucca, NV. We decided to switch back after a dog potty stop so she could drive through the mountains later on. The Nevada desert wasn’t very interesting but we knew that going in. West of Winnemucca, just as I was going to go around a semi, we heard a rumble above. A fighter jet of unknown model flew right over the Westbound lanes, RIGHT OVER US!! It was really low! I was ecstatic. I cheered, “Do it again, do it again!” and then a second one flew over. How often does your wish actually come true?! The second jet did a loop in front of a Star Peak (which I just Googled, I didn’t just know that), then they both flew South. Fighter jet flyovers are probably really common in Nevada, as the federal government is the largest owner of land there, but I’m still very glad we got to witness one two. I continued driving to the California border where Beth took over. The road expanded to three lanes in each direction and they were filled almost immediately with speedy Californian drivers. I had never seen that stretch of I-80 before. Unlike most of it, there was actually som ething to see (the opposite of Nevada)! The hills and trees were beautiful. As we passed over the infamous Donner Pass, we saw a helicopter hovering over Donner Lake. They lowered a rope and everything. I hope it was only a training exercise and not an actual rescue. Beth was now driving because we were headed to her family cabin deep in the Sierra Nevada Mountains. I had never been there before and the roads into the little town of Washington, CA were narrow, winding, and occasionally steep. One particular 15mph switchback turn was especially tight and high above a steep cliff. Washington is a town of 200 and dates back to 1849 during the California Gold Rush. It was originally a mining camp of Indiana natives called Indiana Camp (super creative name guys). Now it is home to three small campgrounds (reservations required far in advance during the Summer), a hotel, a single-classroom school, and some beautiful river and mountain views. Beth and I drove through town, which took all of thirty seconds, and headed towards Beth’s family cabin. The road turned from pavement to gravel (choppy, pot-holed gravel) and followed the South Yuba River. The water level was low relative to the rocks on both banks and on the river bed. It was a river of giant, sun-bleached boulders. There are cabins along the road in various states of repair. Most of them were basic and sm all except one large, recently renovated one close to the road. Someone put a ton of money into that property for sure. It even had a concrete driveway. The road got gradually worse as we approached the 3-Ton Bridge. It’s not a clever name, that’s the supposed weight limit of the little bridge. It’s apparently slated for replacement in the next year and I do not disagree with that decision. It was about 12 feet wide and 25 feet long with only large wooden beams to drive on. There were holes in between the boards so Beth had to line up the tires just right to cross. Not scary at all. We parked on the other side because beyond that point the road is so bad it’s not safe for sedans. Beth told me about a specific rock that juts upward called Oil Pan Rock. Her dad mentioned before we left that there were actually many Oil Pan-destroying rocks, which is why we parked. We had to walk another half mile to get to the family property. Beth’s grandparents built their cabin on [42 acres in 1977] and lived there during the Summer for many years. Ken and Carol, Beth’s parents, brought her and her sisters, Val and Vicki, to visit once a summer for a week or so. They would swim in the South Yuba (which runs right through the property), play games, and read books. It was a great place for relaxation. Because this was my first visit and our time was limited, this trip was more about exploration. Beth shared her memories of their visits as we walked. Her aunt had lived there full time for a while and had let her friends leave random cars there. Some of them have been removed over the years but a few still remain. Beth couldn’t remember if a specific white SUV was there the last time she had visited in 2012 and we got pretty nervous. Because this area is so remote and no one lives there full time, The Bombens have had break-ins, vandals, and squatters. She couldn’t remember if this particular vehicle was there previously or if it belonged to someone living there illegally. We tread lightly not knowing. Beth showed me around. There is a small bunk house and an abandoned camper trailer on the property, both far removed from use. The main cabin is on a hill above the river. It’s seen better days. The windows and doors are locked and boarded for security. The deck is unsafe to walk on. The cabin has seen better days, certainly, but Beth told me about all that used to be. I got the grand tour. She showed me the three trees that her grandmother planted for her and her sisters. I saw her grandmother’s garden and where they spread her grandparents ashes nearby. We then climbed down the hill to check out the river. It was steep and overgrown making it more complicated. Beth claimed to know the easiest path to the shore bu t it, too, was overgrown. There were brambles and impassable boulder piles in the way. I got tired of getting stuck and turned around to search out my own path. Beth let the dog off her leash and she had a blast following us around. She didn’t seem to mind the thorny brambles. Once we finally got down to the water we noticed two people a short way upriver. Trespassers. They were dragging buckets of water up onto the shore dredging for gold. There’s no gold left 166 years after the gold rush (at least according to Ken) but that wasn’t stopping these two. They saw us and pretended to just be hanging out. Without any backup and not knowing if they were armed and potentially dangerous, we similarly pretended to be hanging out. If they thought we were just hiking along the river as opposed to being related to the actual owners, they wouldn’t feel threatened and do something stupid. Besides, there was no evidence that they had disturbed any of the buildings. Hopefully they weren’t living in the woods on the property. I tried not to let their presence bother me but it did change the experience a bit. I had to keep an eye on them for our safety. We looked around, took lots of pictures, and collected rocks. Okay, I collected rocks. Beth made fun of me for it but they’re pretty. Various floods over the years have brought a wide variety of different rocks to the river bed and shores. Not all of them are sun-bleached either. White is the majority but there were plenty of black, pink, and green rocks too. I’m not as fluent in the types of rocks as I once was (sorry Mr. Tate, my 8th grade science teacher) but they were fun to look at and collect. As we were leaving, I knew I would be back with a bunch of tools one day. Carol has received letters from random people wanting to buy the land but I don’t believe she plans to sell. I don’t yet have the construction skills to complete the work myself but I know I’ve watched enough HGTV in the last three years to know I have the skills to at least redesign the cabin. If Ken wants to pay me a small stipend and feed me, I’ll spend a summer out there rebuilding it with him. We’d have to beef up the fence (although they could always get in via the river), repair the deck, replace basically every wall, re-roof, haul away the cars, add a security system, and do a ton of landscaping (don’t think oil pan rock isn’t getting flattened too). Hell, we’d possibly have to start from scratch on a new building site but I know it would be worth it to keep the property in the family. Beth cherishes her memories of that place, known as Poken Oak, and I will do anything to save it. It’s a special place. We explored for almost an hour and then needed to get back to the car. There was still significant ground to cover before bedtime. I took over driving duties again. The mountain passes were extraordinary. I looked past my fear of heights and just enjoyed the twists and turns. Once we back-tracked to Interstate 80 the hills continued. I don’t speed much anymore (Indiana State Patrol knows why) but I had to open up the throttle to keep up with California drivers. I ended up going faster than many people just to keep out of the way of the super-speeders. We were hungry for dinner so Beth found me the nearest In-N-Out Burger, a California staple. Beth had been there before but unfortunately had forgotten how small their menu is. It co ntains burgers, fries, and shakes. That’s it. Beth hasn’t had red meat in 13 years. Whoops. She ordered a vanilla shake and fries while I enjoyed a fantastic Double-Double cheeseburger. The dog loved everything we had, enough to force us to share with her. From dinner we drove another two hours to Beth’s aunt’s house in Concord, CA. Traffic and road construction were a major factor but we made decent enough time. Elaine and Lou Vecchi were hosting us that evening and the next couple days. We arrived quite late having driven 650 miles since sunrise but Elaine and Lou welcomed us in with a warm bed and fresh potato salad (not in that order, that would be weird). The potato salad is a Bomben family recipe that is coveted among them. Elaine had made a batch for our arrival, a true Bomben greeting and especially welcoming considering Beth’s light dinner. Between In-N-Out Burger and Bomben potato salad we had a proper culinary welcome to California. We sat on their patio and caught up. I hadn’t seen Lou since our wedding in 2013 and Elaine since Thanksgiving last year when she conspired with Vicki to fly to Minneapolis for a surprise visit. We also talked shop for our sightseeing plans the next day. It took several text messages and a call to line up when we would be meeting Beth’s other aunt, Debbie, in the morning. We had another full day ahead of us. Sleep was well earned. End of day six.